We’ve talked about building cities from scratch in the Arizona desert and China. In both cases, cities were built on top of undeveloped land. But what if someone wanted to create a city from scratch inside of an already thriving city? 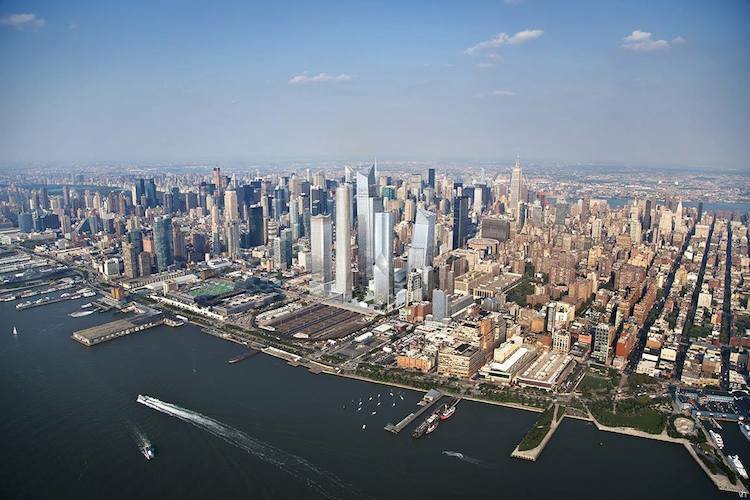 This is the idea behind Hudson Yards, a profoundly ambitious vision for the far west side of midtown Manhattan. The $20B project will have 17.4 million sq ft of floor space containing five office towers, more than 100 shops, 20 restaurants and approximately 5K residences. This would all be stretched over 28 acres, 14 of which would be public spaces and parks. When completed, it would be the largest private real estate development in American history. Construction is well underway, with the first building going up next year and the remainder over the next five years. If you’ve lived in New York City for more than a year, you probably know something about Hudson Yards. The name refers to the massive train yards that reside in the area, which the development will be partially built over. Development has stalled for the last 25 years due to competing interests and bureaucracy. At various times, it was slated to be a football stadium or Olympic village. One issue has always been its location between 10th Ave and the West Side Highway, which is two long avenues away from the nearest MTA train station. That is changing with the extension of the MTA’s 7 train line, a fact that has probably helped get the project moving. Another big asset for the area is the High Line, the defunct elevated-railway-turned-park, which terminates in the area. 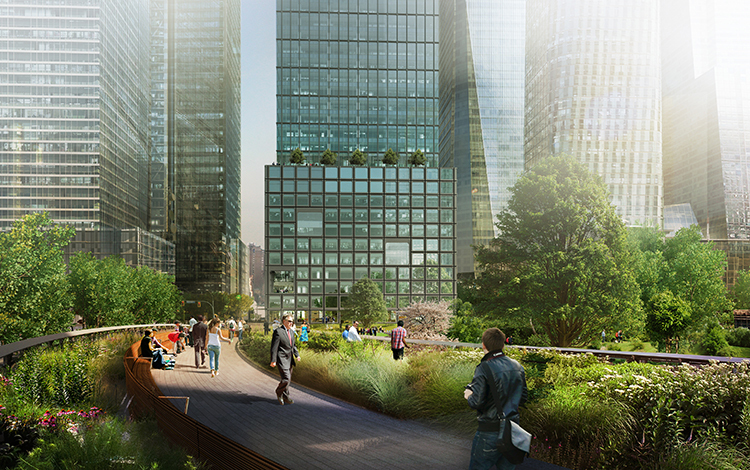 A large swath of the Hudson Yards’ public spaces will be on a platform matching the height of the High Line; this will create a greenbelt from roughly 12th to 34th streets. 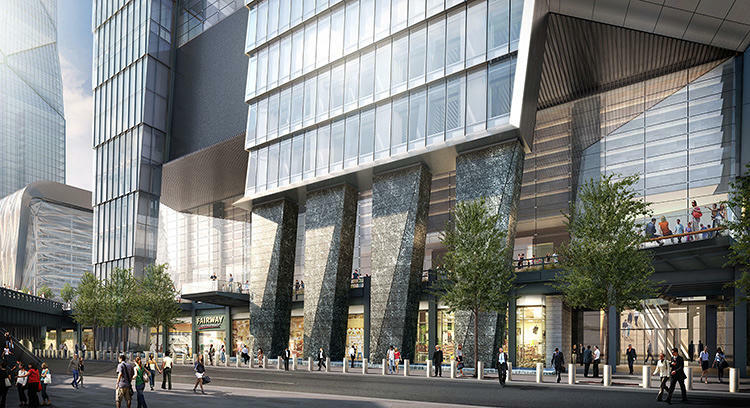 Hudson Yards is doing a little urban experimentation, opting not to emulate its host city in many ways. 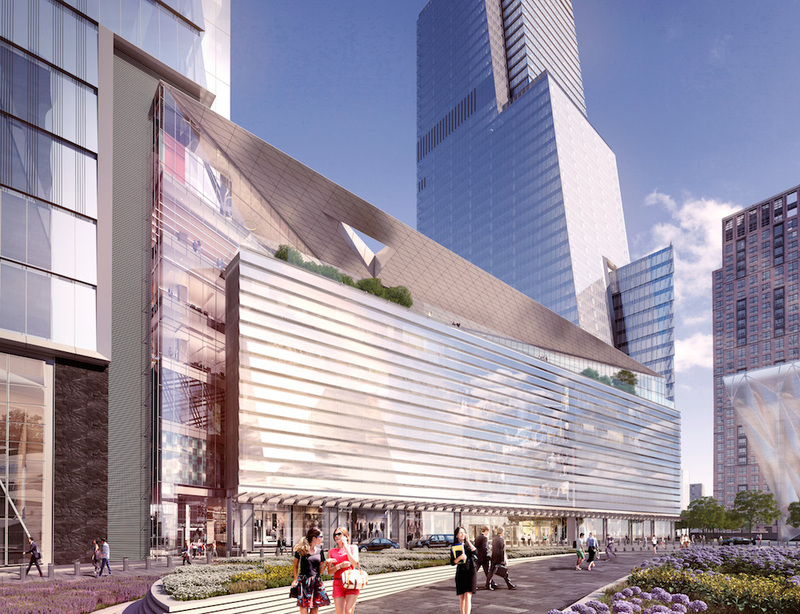 It will have a far less structured approach to urban planning than most of Manhattan, which is typically characterized by uniform streets and buildings with street level retail; in their place, Hudson Yards will have towers dotting copious public spaces (aka towers in a park) and a huge, seven-story shopping pavilion (aka shopping mall) with restaurants and a fancy food-court. 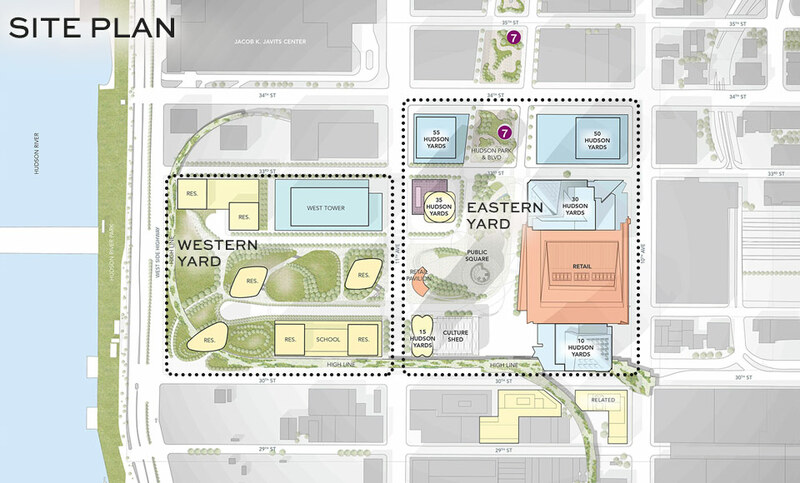 We do have our questions about the Hudson Yard plan. The first revolves around street life. Say what you will about NYC, but most would agree that it’s a very lively place from a human interaction perspective–much of that is a function of its streets and sidewalks, where interaction is sort of inevitable. 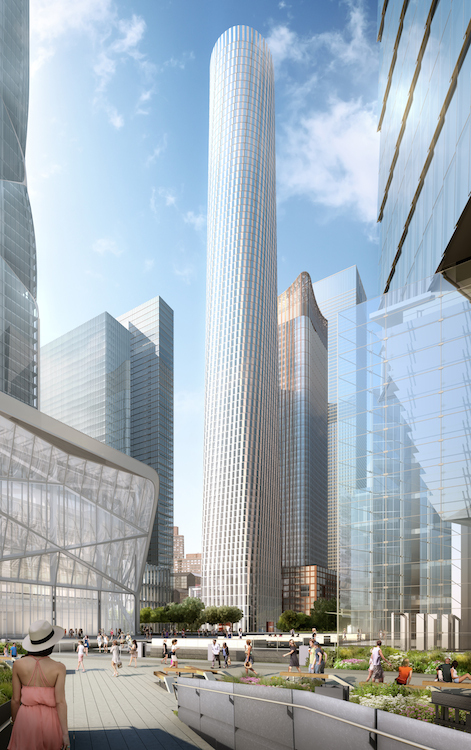 We wonder how Hudson Yards’ big open spaces, which seem more suitable for games of frisbee than serendipitous encounters, will translate into vital street life. Likewise, the mall structure creates destination rather than incidental shopping (i.e. something the melds its way into your day-to-day life), the latter being a hallmark of NYC life. And Fast Company rightfully likened the flashy, irregular-angled architectural style as resembling Dubai’s, where many of the Hudson Yards’ architects have projects. 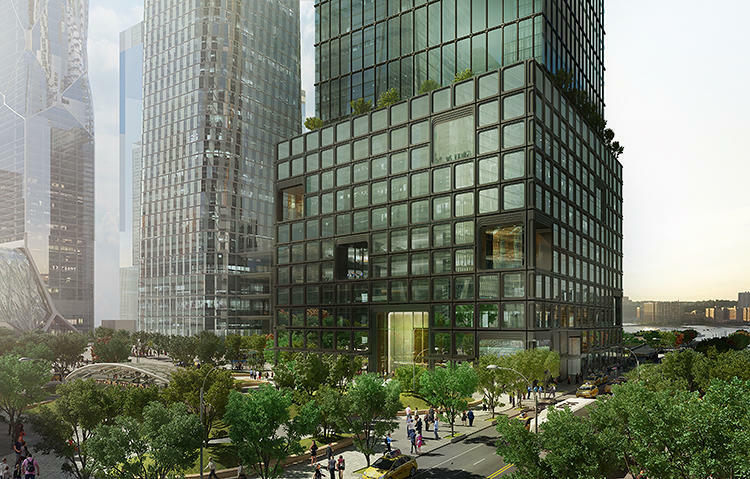 All that said, the renderings look pretty great, and the constant bustle of the High Line, coupled with the residential and commercial activity might serve to make the place interesting, even if it’s in a different way than other parts of the city. We realize that most of our readers don’t have $20B burning holes in their pockets, but if you could design a city from scratch, what would it look like? 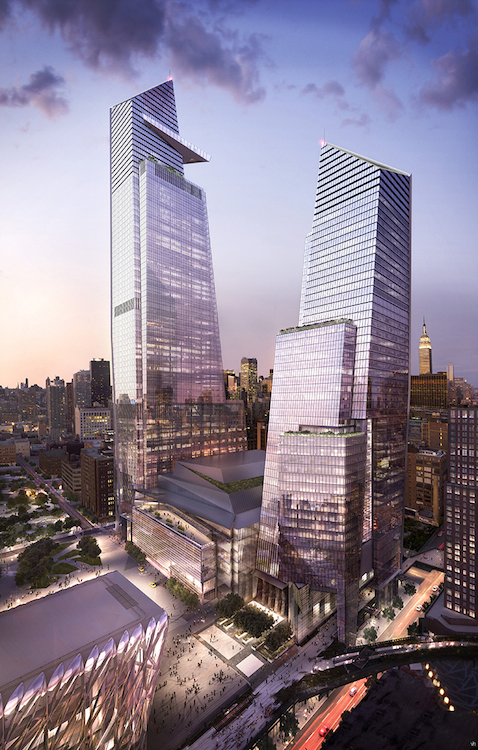 What would you do different from Hudson Yards? What succeeds about their plan? Let us know in our comments section. I would have a huge center park, with benches, trees, and enough room to throw around a frisbee or two. About half of the circumference of “Central Park” would be filled with shops, restaurants, and more. The other side, however, would be lined with two story tall micro buildings. The first floor would belong to one family (or person), and the second would belong to someone else. All of the buildings are designed as if they were on some of the wonderful, old, tree-lined streets in New York. I would build it on the model of the small towns that used to be: larger homes mingled with smaller homes so children from families of varying economic means (and perhaps that translates into diversity of skin color) grow up getting to know each other. There wouldn’t be any need for busing and everyone would have the same educational opportunities in neighborhood schools. I would build it with sidewalks and lawns big enough for gardens (the kind that actually feed families) and play. There would be enough zoning for safety, but retail and the like would be within walking distance. There would be trees enough for shade, but not so many that the sun couldn’t shine through. I’d line it with flowers so that in the summer it buzzed with insects and butterflies and rang with bird song. This, after all, is where every large city started. If I were to build a city from scratch I would use a heliotropic grid. Building codes and lot dimensions would be as such that each structure would have year round solar access. be off grid and use non combustible or fire resistant construction There would be no public utilities such as water, electric or sewer. Nor would there be any administrative buildings, office buildings, financial institutions or large retail.